Albert Dubois-Pillet developed his own theoretical underpinning for his divisionist paintings – a slightly different interpretation than most of his colleagues who did not subscribe entirely to how the technique could function in practice. Suffice it to say that the theory revolved around the way the artist applies primary points of colour when transitioning between one passage of colour (or hue) to another. Whether the viewer is necessarily interested in his theories or not, this watercolour is an exquisite example of how pointillism can produce such vibrant and atmospherically beautiful works of art. 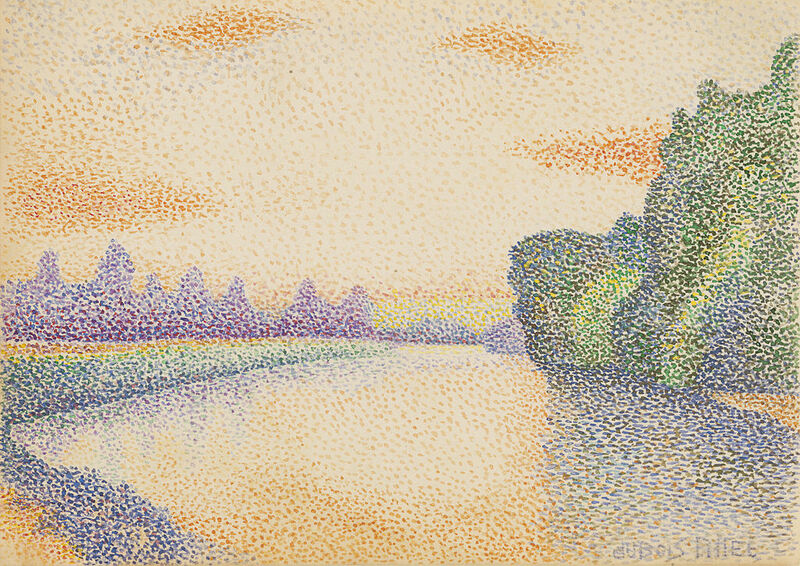 The artist uses an unusual palette of orange with touches of grey-violet for the sky as the sun rises, and the orange is reflected in the waters of the Marne – a favourite motif for Dubois-Pillet. The blue and green points of colour add volume to the trees to the right and create a pulsating passage. As the result of a fire which destroyed most of his work, this watercolour is one of very few surviving works. His early death at 43 is another factor as regards the scarcity of his oeuvre. One cannot help wondering what might have been had he survived and been able to add to his body of work.